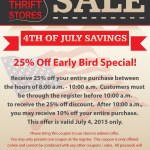 July 4th Thrift Store Coupon! July 4th savings! See coupon for details … happy shopping!